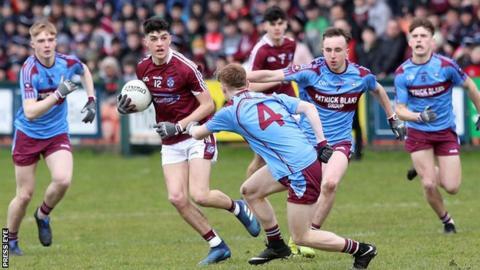 MacRory Cup winners St Michael's Enniskillen progressed to the Hogan Cup Final by beating St Colman's Claremorris 2-13 to 1-10 in Longford. Goals from Caolan Duffy and Conor Love helped St Michael's lead 2-4 to 0-0 after 10 minutes. St Colman's fought back to cut Enniskillen's lead to 2-5 to 1-6 at half-time as Enda Hession netted for the Connacht champions. However, St Michael's regained control in the second half to clinch victory. Naas CBS will be St Michael's final opponents after they defeated Kerry side Pobscoil Corca Dhuibhne 0-20 to 0-14 at Mallow. Meanwhile, St Colman's Newry clinched the Paul McGirr All-Ireland Under-16 Colleges Football title by beating St Mary's Knockbridge 3-6 to 0-14 on Saturday. Oran McCafferty, Adrian Crimmins and Padraig Clancy hit the Newry school's goals.